A chunk of my lifetime ago (OK: circa 2000), I was getting used to fully-digital home recording, having (a) tarted up my PC with a SoundBlaster Live soundcard and other music hardware, and (b) added a Boss BR-8 digital eight-track disk recorder for audio duties. I had no hardware synths, so sound-producing duties in that department were handled by the SB Live card, and one of its signature features: playback of SoundFont sample sound banks. As you may know if you’ve been reading other posts of mine, over the past year or so I have been getting into using Apple iOS devices—first a fourth-generation iPod Touch, and more recently an iPhone 4S—for serious music recording and production. It might surprise you that this is an entirely serious proposition—my most recent album “Homecooked” was recorded completely on the iPhone (two songs on the iPod), albeit mixed and mastered in Logic. I have been building up my collection of instrument, sequencing and recording apps on the iPhone (and some hardware accessories), so I can carry a pretty comprehensive recording and sequencing “rig” wherever I go. 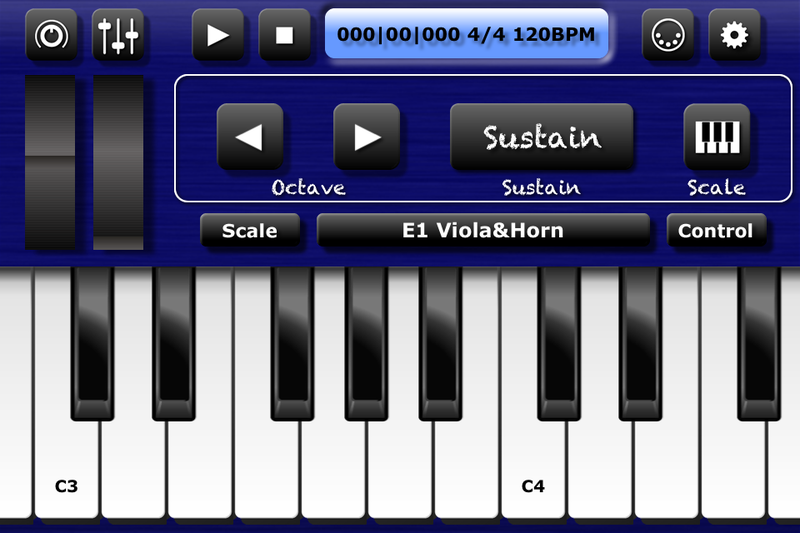 Most of the instrument apps (software synthesisers, rhythm machines, etc.) I have bought for the iPhone, support the Audiobus app for routing virtual audio between compatible apps (so, for instance, a rhythm machine app like FunkBox can be recorded into a track in, say, Multitrack DAW). A few of “my” apps are not yet “on the bus”, including one of my favourites, the wheezily-authentic Mellotron virtual instrument Super Manetron (though at time of writing, the developer say Audiobus support is on the way). However, a few weeks ago Audiobus announced that the latest iOS app (at the time) to add AB support, was one I hadn’t heard of. Bismark bs-16i. Written, like Super Manetron, by a (different) developer in Japan, bs-16i is an instrument app with similar features to other iOS software synths like Sunrizer and Magellan (CoreMIDI, Audiobus, etc. ), but its sound source is different… yes, it’s an iOS SoundFont player. At £5.99 in the UK, bs-16i s a little pricier than most of its iOS instrument app cousins, so I only got around to deciding to “cough up” for it this week. However, my early impressions of it—so far, by loading some of my treasured old SoundFont banks into it—are very positive, and I’d like to write a dedicated review of bs-16i here once I’ve had the opportunity to really put the app through its paces. In the meantime, suffice it to say I wasn’t expecting to renew my acquaintance with my old SoundFont “friends” at this point in my musical life, and especially not on an iPhone (!). That said, I think it’s more than likely that I’ll want to record with the app before long (and not just a “technology demo” to show off what bs-16i can do), which in my book is quite a tribute. Next Post Hello, MakeUseOf readers! Soundfonts are great! I’ve been using them to make instrumentals in FL Studio now for over 10 years, so I know what you mean. Most people sleep on them, but they’re very good sounds to use in my opinion. It got to be where I had enjoyed using them so much, I decided to make my own, and again, 10+ years now, and I wouldn’t stop using Soundfonts ever! Nice track by the way. Keep on making more music… oh, and you mentioned free sounds, you can find some soundfonts to download at http://www.soundsforbeats.com/freesounds.html as well. Hope that helps out. Keep pushing forward on the music. Funnily enough I was listening to Rosewood while I was working today – I really enjoyed it. SoundFonts are all I have to play with, so that’s what I use on Linux and I think they’re wonderful. I use S. Christian Collins’ General User GS sound font library, augmented by some free mellotron strings and a free Bodhran I found by Googling. Apart from that I use X -Synth and Hexter (so I have a DX7 and an analogue synth) along with Hydrogen for drums.